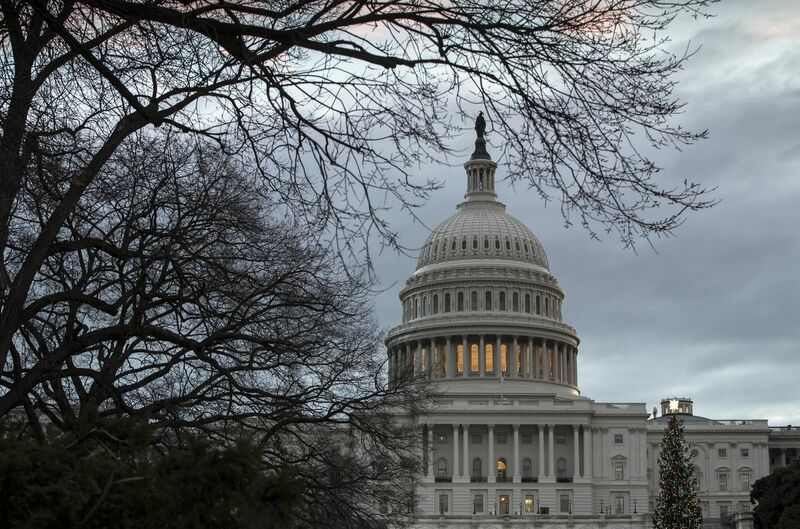 WASHINGTON - Parts of the federal government are set to remain closed through much of next week as the Senate shuttered Saturday for Christmas amid a stalemate with President Donald Trump over border wall funding. Senate Majority Leader Mitch McConnell, R-Ky., announced that his chamber would not return to legislative business until Thursday, which means many federal agencies will remain closed until later next week at the earliest and hundreds of thousands of federal workers will be left in limbo about their status. "Listen, anything can happen," McConnell said. "We're pulling for an agreement that can get 60 votes in the Senate and a majority in the House." The decision came after Trump had a lunch with conservative Republicans and dispatched Vice President Mike Pence to the Capitol to make the latest offer to Senate Minority Leader Chuck Schumer, D-N.Y. That meeting ended after 30 minutes with no resolution. 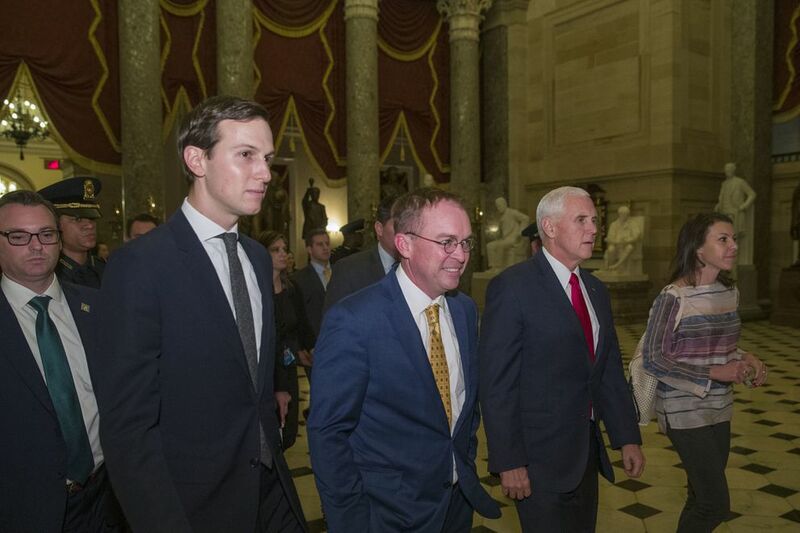 "Still talking," Pence told reporters as he and acting White House chief of staff Mick Mulvaney left Schumer's office; the senator had said he would "remind" the vice president that Democrats would not sign off on funding for a border wall. "The vice president came in for a discussion and made an offer. Unfortunately, we're still very far apart," a spokesman from Schumer's office said. House Minority Leader Nancy Pelosi, D-Calif., vowed to reopen the government shortly after Democrats take over the House, when she is likely to become speaker. House Speaker Paul Ryan, R-Wis., shifted all blame for the shutdown onto the Senate. "Whatever the Senate can pass, and the president will sign, we stand ready. The bill is over there," Ryan said in a brief interview after gaveling his chamber out of legislative session until after Christmas; the House also is not expected to return to business until Thursday. The effects of the partial shutdown, which started just after midnight Friday, will be felt more broadly Wednesday, the first day the federal workforce is expected to return. The Capitol was quiet Saturday morning, after lawmakers went home Friday evening with Congress still at an impasse over Trump's demands for billions of dollars to build a wall along the U.S.-Mexico border. Few lawmakers were in the Capitol on Saturday, and no votes were scheduled in either chamber. Many lawmakers took off Friday night to return to their home states as they awaited word of the talks, having been assured that they will get 24 hours notice before any vote occurs to reopen the closed portions of the government. After the lunch meeting with Trump, Sen. Richard Shelby, R-Ala., suggested Pence would make a new offer to Schumer about wall funding, but Democratic aides said the vice president presented nothing fundamentally different than the previous demands. Senior administration officials Saturday put the onus on Senate Democrats to put forth options that include $5 billion for Trump's promised border wall, saying it was a must for any deal. "The president came into office promising a wall along the southern border. We couldn't just let there be no wall," an official said on a briefing call with reporters. Under the terms of the call, the officials spoke on the condition of anonymity. When a reporter reminded the officials that Trump campaigned on a promise that Mexico would pay for construction of the wall, the officials said the administration continues to believe Mexico ultimately would pay for the wall but would not entertain questions about how that might be. The Mexican government has said it would not fund the wall. During Trump's lunch at the White House on Saturday with the small group of conservative lawmakers, the shutdown and border security were discussed. No Democrats were at the meeting, nor were the Republican leaders of each chamber. Many of the conservatives present pushed Trump to continue fighting for money for his wall. In addition to Shelby, the participants included Sens. Mike Lee, R-Utah; and Lindsey Graham, R-S.C.; as well as Reps. Mark Meadows, R-N.C.; Jim Jordan, R-Ohio; Matt Gaetz, R-Fla.; and Andy Biggs, R-Ariz.
"I don't think it's imminent that we are going to reach a deal," Shelby told reporters upon returning from the lunch. Shelby said that the participants in the lunch - which included some staunch conservatives - offered "mixed" advice on whether to compromise or dig in for a long shutdown. In the Senate, McConnell opened the chamber Saturday with a 10-minute address that had hints of optimism but stronger suggestions of a partisan standoff that could last well beyond Saturday. 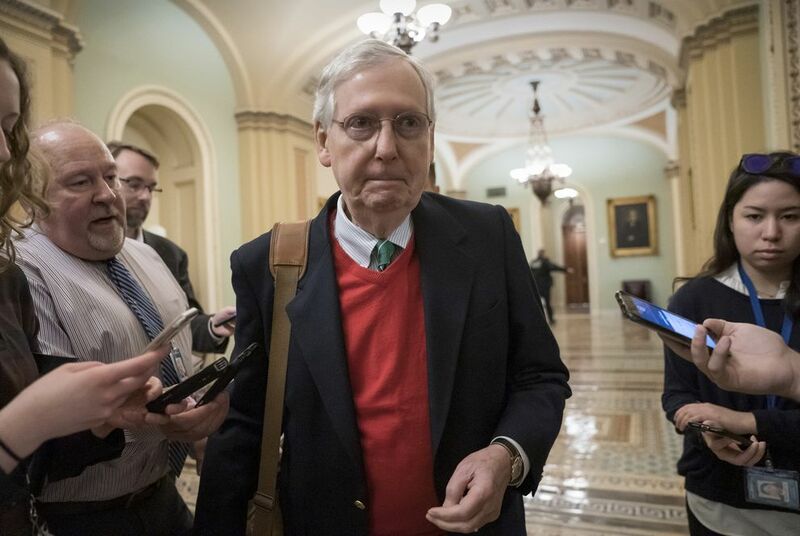 Pointing to his red seasonal sweater, McConnell said he "hopes that Christmas is not too far away" and declared that the solution is "really simple." But McConnell then tried to pin the blame on Senate Democrats. He suggested the government would remain closed "until the president and Senate Democrats have reached an agreement" - even though other Republicans have suggested this is a five-way negotiation among the White House and the four congressional leaders. He pointed out other times when Senate Democrats had voiced support for border wall funding and yet now objected to any funds that would go toward an actual wall. "They've refused to meet President Trump halfway," McConnell said, declining to mention that those past talks included concessions by Trump on a path to citizenship for 1.8 million undocumented immigrants. No such grand deal is on the table now. Finally, McConnell reiterated the point of Friday's agreement to hit the "pause button" in the Senate so that there would be no more votes until a final deal is reached. "It's my hope that it's reached sooner rather than later," he said. A few minutes after McConnell spoke, Schumer suggested Trump was the impediment to the government reopening. "At midnight last night, roughly 25 percent of the government shut down because of one person and one person alone: President Trump," Schumer said. "We arrived at this moment because President Trump has been on a destructive two-week temper tantrum." Schumer rejected the idea that a deal had to be brokered between him and Trump, saying McConnell and House Speaker Paul Ryan, R-Wis., could not "duck responsibility" from the negotiations. He and Pelosi continue to support $1.3 billion in border security funds as long as they are not spent on building a wall and instead go toward technology security, such as drones. "If you want to open the government, you must abandon the wall, plain and simple," Schumer said, accusing Trump of supporting an inefficient wall that would end up "swindling the American taxpayer." Across the Capitol, the House had become a legislative ghost town. Shortly before noon, six Republicans and two Democrats were milling around the floor, with the Republicans discussing travel plans and Democrats preparing to speak. At noon, the House was called to order with a prayer that asked members to consider those "whose lives are made more difficult" by partisan standoffs. Seconds later, with the slam of a gavel, the House was adjourned. Republicans walked off the floor as House Democratic Whip Steny Hoyer, D-Md., and Rep. Jim McGovern, D-Mass., asked for order to "pass a bill to keep this government open." Off the floor, Hoyer said that the House was in limbo, perhaps for days, unless the Senate came up with something that could pass. "Predicting what this president is going to do is not a worthwhile enterprise," Hoyer said. "I'm going to go to the Maryland basketball game this afternoon. Why? Because the Senate is negotiating. The earliest we could vote is on Monday. That's Christmas Eve. If they had agreement today, they might end up [holding the vote] on Wednesday night." Rep. Ralph Norman, R-S.C., a member of the House Freedom Caucus who represents Mulvaney's old seat, appeared on Fox News from his district to say he wasn't returning until a deal was struck. "There wasn't much happening that we could take part in," Norman said. "It's up to the 60 votes in the Senate. I think Mitch McConnell can come up with the 10 Democrats, hopefully. If not, we're going to sit until we have a secure border." There are just 51 Republicans in the Senate until January, and two of them - Sen. Jeff Flake, R-Ariz., and Sen. Bob Corker, R-Tenn., are retiring and have signaled that they would oppose the border wall funding. Rep. Mike Simpson, R-Idaho, who had dropped in on the short pro forma session, reiterated that the House wasn't able to move until the Senate did. Like Hoyer, he was prepared for a shutdown that lasted past Christmas, with members leaving town before the government was funded. "I had a flight last night, I have one tonight, and I am going on the one tomorrow night," said Simpson. "I thought we might actually get out on December 7. We had nine of the twelve appropriations bills ready to go." Asked about the political impact of the shutdown - and of Trump's on-again, off-again effort to take credit for one - Simpson said it hardly mattered. "Nobody's going to remember this in two years," Simpson added. "I don't really listen to what he says anymore. If I did, I'd be listening every minute to see what had changed." But after a fierce conservative backlash against the deal, including from media outlets and figures known to have Trump's ear, the president reversed course - a flip that garnered bipartisan protest on Capitol Hill.